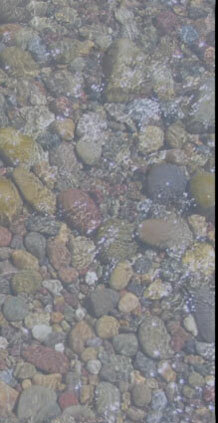 Brenda is a licensed, professional guide with twenty-two years of experience on the South Fork of the Snake River. She is an excellent teacher who has won over many rookies with her enthusiasm and patience. Whether you are a beginner or a seasoned angler, you can expect a day spent with Brenda to improve your casting, technique, knowledge and enjoyment of fly fishing. Brenda is well known and respected by many experienced anglers and guides both for her professional manner and for her productive fly patterns. Her flies were featured in Fly Tyer magazine and have been used in Jackson Hole's famous One Fly Competition the past sixteen years. Brenda was also featured on Outdoor Life Network's Fly Fish Television Magazine and The Sporting Fly's DVD Snake River, Idaho. 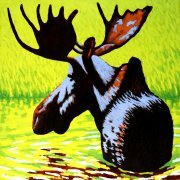 In the off season, you can find Brenda in her Kansas City, MO studio painting landscapes from the Yellowstone / Teton area. Brenda books all guided trips through WorldCast Anglers. 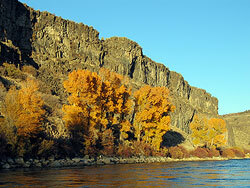 The South Fork of the Snake River presents a spectacular variety of pleasures for your guided trip. With 3,000 to 7,000 fish per river mile, you will have hours of opportunities to catch and release that eager cutthroat, rainbow or brown trout. The South Fork is famous for its outstanding dry fly fishing, with multiple stonefly, pale morning dun, and caddisfly hatches. In addition to its great fishing, the South Fork also has breathtaking scenery and abundant wildlife, including bald eagles, golden eagles, moose, otter, beavers and more. A day spent floating the South Fork will leave a lifelong impression. 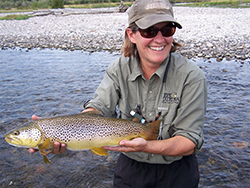 Brenda also guides on the Henry's Fork, the Teton River, the Snake River in Wyoming, and the Salt River. The Henry's Fork offers prolific hatches, fast boulder-strewn runs to the world famous calm spring creek fishing of Railroad Ranch. The Teton River offers stunningly beautiful landscapes, as well as native cutthroat and rainbow trout eager for dry flies. The Salt and the Snake in Wyoming and offer approximately sixty more miles of spectacular fishing waters. Take your time exploring the different fisheries near the South Fork. Summer and fall in the Snake River area offer incomparable beauty, unbeatable weather and endless opportunities to enjoy the outdoors. Fill your family vacation with hiking, whitewater rafting, golfing and horseback riding. Spend a day -or several- exploring Yellowstone and Teton National Parks. Jackson Hole, Wyoming is an excellent base camp for your unforgettable western vacation. Currently fishing dry flies with droppers. Dry fly fishing is improving daily. South Fork is clear and beautiful. I still have openings in September and October if you get the chance to fish--book now to reserve your preferred section. How does this wildest dream keep going? Thank you to my past and present clients and friends.